The company’s decision to announce a 1:1 bonus is likely to improve sentiment for the shares, but only temporarily. RIL has a large institutional investor shareholder base, which realizes that bonus share issues don’t have any impact whatsoever on the valuations of a company. Still, there may be some buying by traders in the short term. The company’s global depository receipts listed in London were still trading at the time of announcement, and these rose by about 4% soon after the announcement. As things stand, much of the upside in the firm’s shares is expected to be from unexpected discoveries in the exploration and production space. The outlook for the core refining and petrochemicals businesses has improved marginally with the recovery in the global economy, but is far from bright, given the large capacities that have come up in recent times. 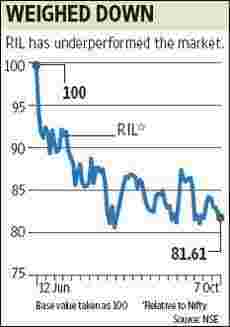 But in the near term, the overhang of the legal battle with RNRL and the trend of weak refining margins may continue to weigh the stock down.